The temple of Lord Venkateswara on Tirumala is the richest temple in the world, located in the holy town of Tirupati in Chitoor district of Andhra Pradesh. 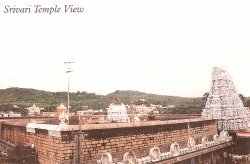 The temple is located atop one of a range of seven hills - Seshadri, Garudadri, Venkatadri, Narayanadri, Vrishabhadri, Vrishadri and Anjanadri. 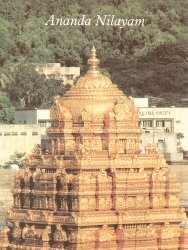 Srivari Padala Mandapam at Alipiri is at the foot of the Tirumala Hills where the Lord Himself appeared. Pilgrims commence their trek to Tirumala after offering prayers at this temple. Huge padukas offered by devotees to the Lord are displayed here. There is another stepway to Tirumala near Chadragiri used by devotees who climb the Seven Hills on foot. Tirumala temple rituals are performed as ordained by Sri Ramanuja. Arjitha Sevas like Kalyanotsavam, Vahana Sevas and Unjal Seva are not performed during the above festival days. Sravana Nakshatram being the birht star of Lord Venkateswara, special programmes will be conducted on Tirumala on the days of the star. Ekantha Seva is performed at 10.30pm everyday subject to rush. A velvet bed is spread on a swing and the Lord's Murti is placed on it. A descendant of Tallapaka Annamacharya's family sings keertanas. Tonsure and Tirumala go together Devotees vow and offer their hair to the Lord - a symbolic sacrifice of the ego. Tonsure is done at Kalyana Katta. It is followed by a holy dip in the Pushkarini and the devotees then proceed to the temple for darshan. The first step, the entry into the Temple proper, is through the Mahadwaram on the East Mada street. Upon entry through the Mahadwaram you come into the Pratima Mandapam where the statues of Sri Krishnadevaraya, emperor of Vijayanagaram and his two consorts has been installed. To the left is the 'Tulabharam', scales upon which materials are weighed against the devotees for being offered in the temple. There is a shrine of Sri Ranganatha in a Mandapam called Ranganayaka Mandapam where Vahanas of the temple are kept now. The next point is the Tirumalanayaka Mandapam with beautiful carvings. A statue of Raja Todarmul, a general of the Karnatak Nawab, and statues of his mother and his wife are found in a corner of the mandapam. The fully gold plated Dhwajasthambham is in a mandapam containing carvings of Avatarams. From here you proceed to teh inner gopuram on the inner prakara where you find to the left a small but beautiful shrine of Sri Varadarajaswamy. To the left of the shrine is the 'Potu' (kitchen) wherein a small shrine of Vakuladevi is installed. The next spot is the gold plated well in the vicinity of the Potu known as Bangarubavi. As devotees proceed from this spot, the mood is suddenly heightened and surcharged with emotion. Shouts of 'Edukondalavada! Govinda! Govinda!' rend the air. Now you are nearing the Bangaruvakili (the Golden Gate). As you turn into the Gate you find Lord Garuda in a take-off posture with wings spread to carry the Lord on his immense shoulders. Immediately after this you reach the Dwaarapaalakas, snetires on either side of the Bangaruvakili, the entrance to the Sanctun Sanctorum. The long hours of wait and your inexhaustible patience bear fruit now, as you are i the immediate presence of the Lord. As you are having your fill of the darshan of the Lord, you are jolted into hard reality and pused aside and away from the Presence with the interminable 'Jargani! Jargandi' (Move away!Move Away!) of the marshals. The rush out of the sanctum deprives you of the vision of the great temple bells just outside the Ardhamandapam. Teerthaprasadam is given outside and Sataari placed on your head. To your left on the corridor you find the Parakamani in two sections, one for counting coins and the other for currency notes. Just after the Parakamani is the old Kalyanamandapam where tickets for the free meal provided by the TTD under the Nityannadana Scheme are issued. As part of fulfilment of their vow to the Lord, devotees offer ornaments/money and drop the same in the Hundi, which is located opposite Sri Ramanuja shrine. Vishvaksena: Vishvaksena is an attendat deity regarded as the commander of Sri Vishnu's troupes. His shrine is located in the innder circuit of the northeastern corner of the sanctum. 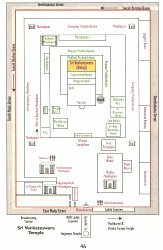 Towards the northeastern corner are located Tallapaka Ara, known as Sankeertana Bhandaram, (the original repository of Ammamacharya's copper plates), Sri Ramanuja's shrine and Sri Yoganarasimhaswamy's shrine. In between is a stall selling golden Balaji dollars. As you come out of the inner Prakaram and turn to your left you can collect free Prasadam. Next you can reach Aiyana Mandapam (mirror hall). Unjal Seva is performed in this mandapam. Now you cone out of the temple complex into the Mada strret and collect laddu prasadam at the counters. Malayappa Swamy is the four handed Utsavamurti or the processional deity. Two of the hands hold the Sankahm and the Chakram. The grandest period for Malayappa and his consorts is the Car Festival. The Brahmotsavam or annual festival is celebrated on Tirumala for nine days when the sun enters Kanya Rasi from Aswayuja Shuddha Padyami to Aswayuja Shuddha Dasami during September /October. This Utsavam is said to have been first celebrated by Brahma Himself; hence the name. Every morning and evening Utsavamurtis are taken around the temple on different Vahanams decorated in varied raiments, glittering ornaments. The important festivals are the Garudotsavam on the fifth day and the Rathotsavam or Car Festival on the eighth day. Arjithabrahmotsavam can be celebrated by devotees upon payment on days other than the days of the Brahmotsavam. In fact, no Arjitha Sevas are performed during Brahmotsavam. This festival is performed once a year in February?march for five days. This festivalis performed three days a year, generally in the month of June. This seva is performed on Anivara Asthanam day, generally in the month of July. This Utsavam is performed on Sravana Nakshatram day after Brahmotsava. This festival is performed four times a year on the Tuesdays before Ugadi, Anivara Asthanam, Brahmotsavam and Vaikunta Ekadasi. This Utsavam is generally performed in August every year for three days. 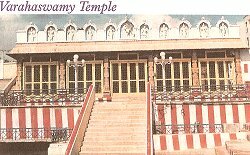 Located on the South Mada street in the vcinity of the main temple, this Mutt is an important place on Tirumala. Hathiramjee was an ardent devotee of Sri Balaji and the Lord Himself is belived to have visited his Mutt regularly. Dasavatara idols and Sri Krishna temple inside the Mutt are worth visiting. The Hathiramjee Mutt was taking care of the Tirumala temple prior to the formation of TTD in 1933. This temple is located on Sannidhi street near Asthana Mandapam. A fifteen minute walk from Varahaswamy temple on the way to Dharmagiri brings you to this elevated view point. Silathoranam is just another five minute walk from here. This geological arch is a very rare spectacle in the world. This arch (older than the Jurassic age) is 25 ft in length, 10 ft in height. Only two other similar formations are known to exist in the world (in the UK and in the USA). Two kilometers from Sila Thoranam is the Veda Vignana Parishad (Schol for study of Vedic Sciences) on Dharmagiri Hill established by TTD. An impressive idol of Brahma displaying the four vedas welcomes the visitors at teh entrance. The traditional Gurukulam Ashram surroundings and the rhythmic chanting of the Vedic hymns by the students make the visitor feel the pulse of the vibrant culture of the ancient Hindus. After a ten minute walk from Shilathoranam road, the visitor comes to a road junction. One road leads to Dharmagiri and the other to the highest peak of Tirumala hills, Narayanagiri. Shri Narayana Pada is found here. A scripture in the temple museum describes this place as "it is an anthropological evidence of the hoary antiquity of Tirumala. The wheel carved therein represents Narayana, the aspects of Suryanarayana, worshipped by the early men".